Dog bakery supplies come in all sorts of fun and creative designs, shapes and sizes. You can make unique dog treats and create your own signature style. So what dog safe supplies are important for a successful dog treat business? First, you need natural ingredients. Next you need to avoid chocolate and large amounts of sugar or fat. You will find it almost impossible to find most of these items in a regular grocery store or even a health food store. For example, the closest thing to natural carob or yogurt you will find is carob and yogurt chips which are not really carob or yogurt at all; they are sugar and fat. You certainly won't find frosting designed for dogs in a supermarket. In fact, there is only one line of natural frostings that are specifically designed for dogs. The Fido's Frosting Line and Magifrost dog treat frostings is designed for dogs and is used worldwide by dog treat businesses. You can only find this product at a store that sells dog bakery supplies. Anything else you would need to supply your dog treat business. Questions about dog treat icing or dog treat frosting? 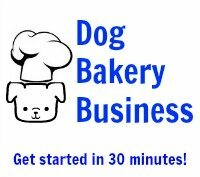 The good news is that these dog bakery supply stores serve a specialty audience that is widely dispersed, and so they most likely will have an internet based store. 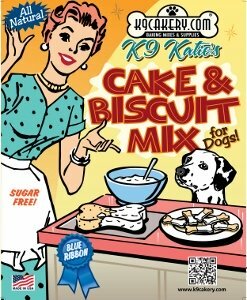 That is good news for dog treat bakers because it means you can get access to healthy supplies no matter where you live. Take a look at our free healthy dog treat recipes for ideas on some treats you can make for your dog treat business. Of course there are endless supplies of dog treat recipes on the internet. The real challenge is to develop recipes that use the same basic ingredients or you will have a lot of potentially perishable goods going bad before you have time to make each recipe several times. Many new businesses (and even many well established businesses), choose to use a base mix sold by a dog bakery supplier so that they get the benefit of a well designed mix without having to purchase and hold numerous individual ingredients. The basic mix is used as a beginning and different flavors or additional ingredients are added to develop a variety of baked goods. As you become more established, you will find that you will offer a smaller number of proven recipes rather than a larger number of varieties. You will find which flavors sell best and most likely that is what your customers will want to purchase, making it clear that you should drop the weak selling items from your product offerings. Keep reading this website for more valuable information, the information you find here will save you enormous amounts of time and money. We have already made the mistakes for you, learn from our advice and you will be very far ahead of where you would be if you had to make all of your own mistakes. Click here to find dog bakery supplies to make your own dog treats.